Many card colours available to suit your theme. Inspired by the fields around West Oxfordshire, the Cotswold Hares Wedding Invitation is designed in a folder style so you can put all your wedding information in one place, no need for a separate information sheet. This design can be re-coloured to fit with your wedding theme, The stationery in the photos is printed on to GF Smith Colorplan Stone. A print only range, Chalkboard Floral is decorated with wild field flowers. Printed on GF Smith Colorplan, the Save the Date, RSVP, Invitation and Menu are duplexed (backed) with a lovely silky smooth card-stock for a quality feel. The Invitation, RSVP and Save the Date comes with a GF Smith Colorplan envelope, Claret is featured but it also works well with Scarlet, or Mid Green and Candy Pink. 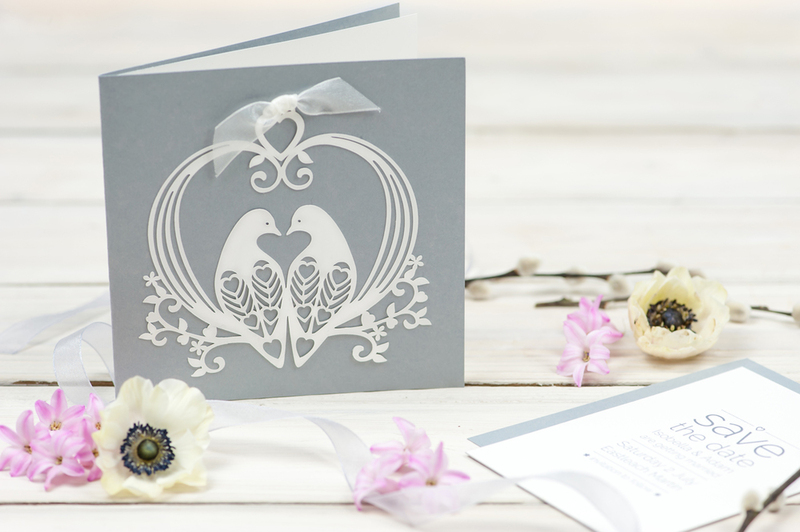 Inspired by Indian wood-block printing, Indian Summer is our first range to use cutting not just on the invitation. The day invitation is designed in the folder style to incorporate all your wedding information. This range also has an alternative evening Invitation design with pretty border cutting. Name cards include a pop-out cut butterfly and can be made as tent cards or tags. Can be made in a variety of colours. Cherry Blossom can be made either as a standard flat invitation with the paper-cut detail, or in the folder style to fit in all the information you need. With a gentle nod to Art Nouveau, a vine arches over the tree. Initials entwined in the roots symbolising love growing. Cherry Tree can be made either as a standard flat invitation with the paper-cut detail, or in the folder style to fit in all the information you need. Shown below in Bordeaux, the cut tree looks equally good in off white with a coloured insert. Old English roses entwine around your initials. This beautiful stationery range is trimmed wth organza ribbon. This pretty heart is entwined with flowers and foliage, finished with organza ribbon, and has space to be personalised with the bride and groom's names. Butterflies gently flutter around a flowering tree whilst love birds only have eyes for each other. A little luggage tag is tied to the tree with organza ribbon to be personalised with the name of the bride and groom.